The PDF and WEB pages have been added to the http://www.sandislandlighthouse.com.com web site. Please take a look. 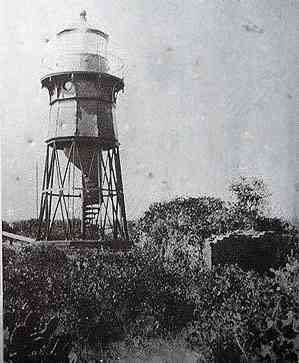 There are photographs of one of the actual keepers of Sand Island Lighthouse. Have you seen the lantern at the Mobile Airport? Well with the help of the United States Coast Guard the Alabama Lighthouse Association has obtained the original lantern from the Middle Bay Lighthouse and now has it on display in the recently renovated lantern room in the lobby at the Mobile Alabama Municipal Airport. Wow what a unique site to see the two of them reunited. If you get a chance take time to visit the airport and see this great exhibit for FREE. Once the National Maritime Museum is completed in Mobile this will become one of the premier exhibits at the museum. And thanks to the volunteer efforts of the members of the Alabama Lighthouse Association you can see this piece of history up close. But be careful there are many historical tidbits around the exhibit and you might learn a little bit of Alabama's history if you are not careful! Project Team to visit the lighthouse this week on or about Nov 12 2007 The team is prepared to enter the tower on this trip. The climbing experts will scale the inside of tower to replace the safety line to the top of the tower. This line is made fast for usage with their climbing harnesses by the rest of the team when climbing the tower as a safety rope. Other team members will excavate the weight well at the bottom of the tower. The excavation will examine the well for evidence of settlement cracks. The tile floor will be exposed in several areas and also examined for cracking. The present condition of the floor and weight well will be documented for future use. Another group of the team will be inspecting the exterior of the structure as part of the bidding of the repair project that is underway to fix some of the damage near the bottom of the lighthouse.